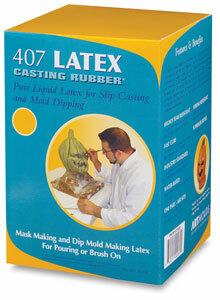 This premium casting rubber may be used to make high quality masks, body parts, and as a skin over polyurethane foams. A product that is noted for its very good consistency, it may be thinned with water if needed. ® ArtMolds is a registered trademark.® 407 Latex Casting Rubber is a registered trademark.